Celebrated L.A. contemporary artist Ruth Weisberg is the subject of a new exhibition entitled “Ruth Weisberg: Reflections Through Time,” opening with a reception for the artist from 6:00 to 9:00 p.m. on Saturday, June 13, at Jack Rutberg Fine Arts, located at 357 North La Brea Avenue in Los Angeles. The exhibition extends through September 30th. Opening Reception: June 13 from 6:00 – 9:00 p.m.
Related Event: Saturday, July 11, 2015 ~ 8:00 p.m. 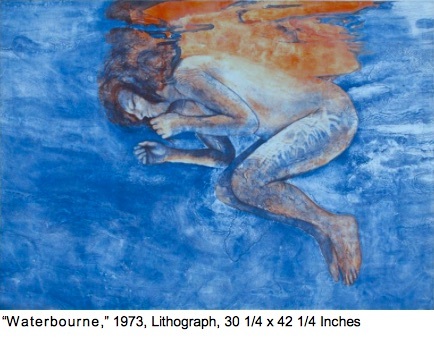 Included in “Reflections Through Time” are selected works, such as Weisberg’s iconic “Waterbourne” (1973). Here the artist joins both symbolic and literal reflections of light, and in this case, a personal passage of impending motherhood and the emergence of woman. Other works in the exhibition, including her most recent work “Harbor” (2015), engage reflections on personal history and of the convergence of art history and cultural experience. “Reflections Through Time” reveals Weisberg’s decades-long interest in re-imagining the works of past masters such as Velazquez, Watteau, Blake, Titian, Veronese, Cagnacci, Corot, and Giacometti. In this exhibition, however, reflections of art history take on extraordinary, if not supernatural form in the painting titled, “Return” (2014) and its related drawings, as Weisberg recognized that the primary figure in a masterpiece painting in the Tel Aviv Museum, the self-portrait by Maurycy Gottlieb, entitled “Jews Praying in the Synagogue on Yom Kippur” (1878) is a virtual twin of Weisberg’s son, Alfred (better known as the celebrated contemporary musician, Daedelus). 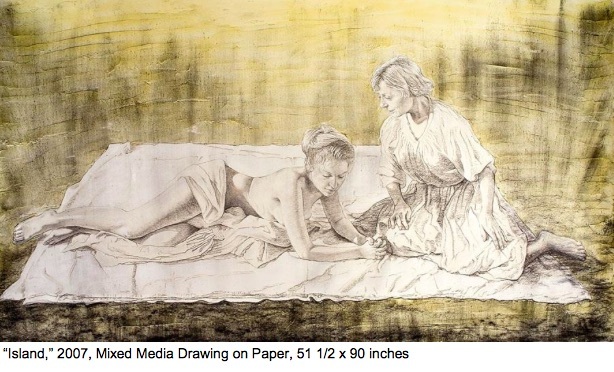 Through veils of washes and tones, Weisberg brings past-time into contemporary context. Memory is a dominant point of origin/departure in Weisberg’s works as her themes also meld art forms as in her ”La Comedia e Finita” (1977), depicting Watteau’s Pierrot pulling back the curtain on the climactic scene of Marcel Carne’s epic 1943/45 film, “Les Enfants du Paradis (Children of Paradise)”. Other recurring themes include diaspora and homecoming, phantom lovers and rites of passage. Her depictions of grouped children, as in “Together Again” (1975), are as evocative of memories of her own childhood in Chicago as they are to projections of those possibly lost in the Holocaust. “Reflections Through Time” includes a monumental drawing, “Island” (2007) inspired by 17th-century Italian painter Guido Cagnacci, which was shown in an exhibition at the Norton Simon Museum of Art. Weisberg is the first living painter to have been afforded a solo exhibition at the Norton Simon Museum, when she was invited to exhibit a body of work based upon a work in the Museum’s collection of her choosing. Weisberg also holds a similar distinction as the first living artist to receive a solo exhibition at the Huntington Library, when Weisberg created a series of works inspired by William Blake’s engraving, “The Circle of the Lustful” (1826-27), in that museum’s collection. “Reflections Through Time” at Jack Rutberg Fine Arts also includes works from that exhibition. Ruth Weisberg is currently a professor at the University of Southern California where she was, until 2010, one of the longest tenured Deans of the Roski School of Art and Design. Her first major survey in Los Angeles was in 1979 at the Los Angeles Municipal Art Gallery. The subject of over 80 solo and nearly 200 group exhibitions, Weisberg’s work is included in the permanent collections of over 60 museums, including the Metropolitan Museum of Art in New York, National Gallery of Art in Washington, D.C., Whitney Museum of American Art, Portland Art Museum, Los Angeles County Museum of Art, Getty Research Institute, Norton Simon Museum of Art, Art Institute of Chicago, Detroit Institute of Arts, Biblioteque Nationale in Paris, and Rome Institute Nationale per la Grafica, among many others. Special event programs related to this exhibition will include an evening conversation with Ruth Weisberg and Jack Rutberg on July 11 at 8:00 p.m. Seating will be limited and reservations required. Tuesday – Friday 10:00 – 6:00, Saturday 10:00 – 5:00.